Breakfast at the Roosevelt Inn begins with our fabulous custom buffet. Enjoy Gordon Ramsey’s delicious recipes specially crafted for our dining room! Fill your plate with our freshly baked muffins or scones, orange zest waffles, homemade granola and our colorful fresh fruit salad with honey Greek yogurt. 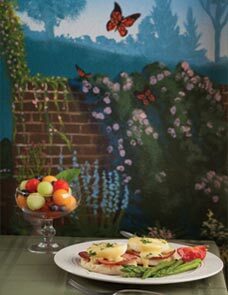 We then invite you to have a seat in our beautiful mural dining room where you will be served our custom-blend Roosevelt coffees, tea, and juice of your choice. Here, you may enjoy your buffet gleanings while sampling the specialty egg dish of the day, seasoned potatoes, and your choice of thick-sliced hickory bacon or savory sausage. We keep our breakfast flexible to fit whatever your getaway calls for. So enjoy this lavish gourmet quality breakfast any morning between 8am and 10am. Room service can be included in your Coeur d’Alene lodging package for a nominal fee upon request. The morning newspapers are at your disposal to help ease you into the day. We invite you to socialize and share your experiences with other guests, there’s always plenty of conversation to be had and new friends to make. However, if you prefer a little more privacy, you can enjoy your morning coffee in either the front parlor or on the lawn furniture in our beautifully manicured gardens. In the afternoon and evening, return to enjoy our freshly baked sweets, refreshments, and our manager’s wine and cheese reception. 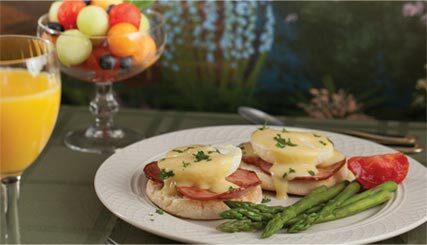 We look forward to serving you at our bed and breakfast in Coeur d’Alene, Idaho!